Atherosclerotic renal artery stenosis commonly co-exists with systolic and/or diastolic heart failure and is an unfavorable prognostic indicator. 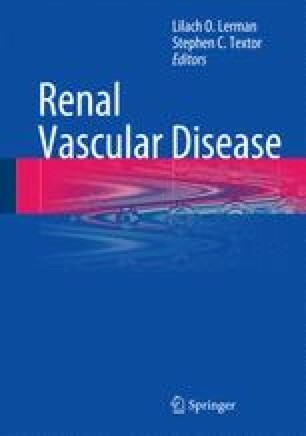 The morbidity and mortality relates to a complex neurohormonal interplay whereby renal ischemia activates the renin angiotensin aldosterone axis resulting in sodium retention, arterial vasoconstriction, and accelerated end-organ damage. In a subset of patients, particularly with bilateral renal artery stenosis, acute episodes of severe hypertension may lead to “flash” pulmonary edema. Often sharing a common pathophysiology renal artery stenosis is especially common amongst heart failure patients with a 31 % incidence in those who undergo renal artery revascularization. The best course of treatment of renal artery stenosis in the setting of heart failure remains unclear. Although renal artery stenting has no effect on mortality, revascularization may lead to improved control of heart failure as evidenced by a reduction in hospital admissions and improvement in NYHA heart failure class.